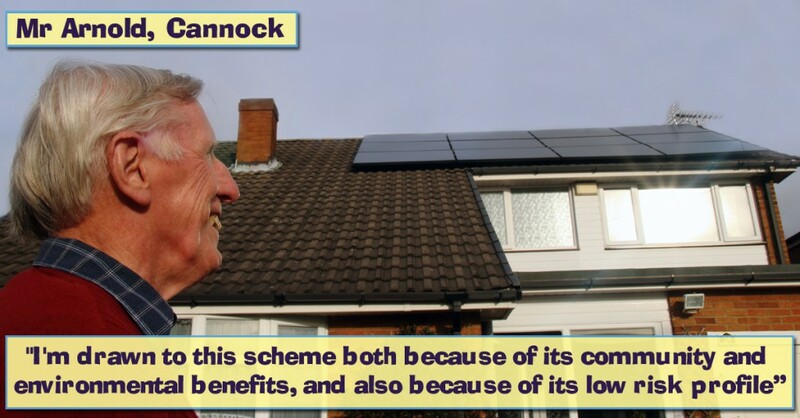 Meet some of the tenants benefitting from having PV solar panels installed on their council-owned bungalows, and also some of the people who have invested in our community energy scheme. To find out more about how the scheme works and all the benefits both tenants and investors will enjoy, please head here. 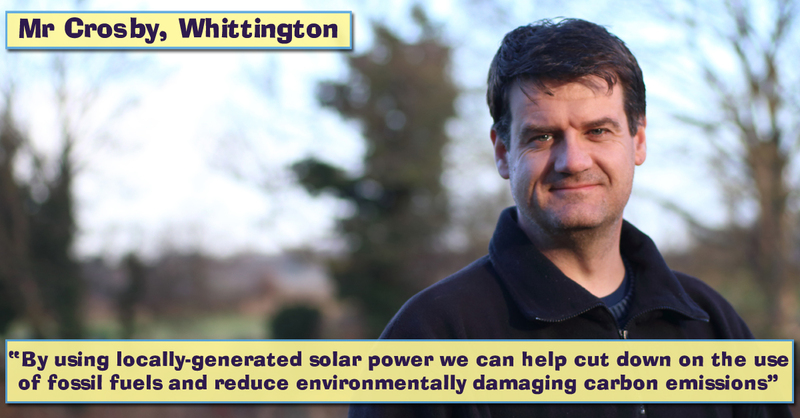 Mr Crosby lives in Whittington, near Lichfield, and is a strong supporter of renewable energy. 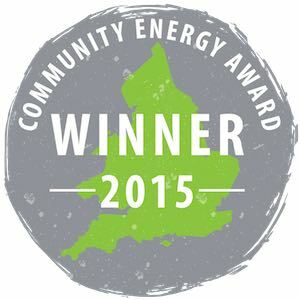 “I have invested in this great community project because it’s a unique chance to help pensioners with their electricity bills but also to make a good return as an investor,” states Mr Crosby. “Such opportunities are, in my experience, rare! “I’m drawn to this scheme both because of its community and environmental benefits, and also because of its low risk profile and the healthy forecast rates of return, both in terms of interest income and of the refund of capital invested over the 20 year life of the project. Roy Maydew, aged 65, is an ex-foundry worker living with his partner, Chris. Mr Maydew has invested £2000 in the project. “I’ve been retired through ill-health these last five years. I’ve had strokes and Crohn’s disease and I’m unsteady on my feet. So I’m here most of the time during the day and can get the free electricity. It’s a great scheme. Also it’s good because I won’t have to worry about the upkeep or look after the panels myself. 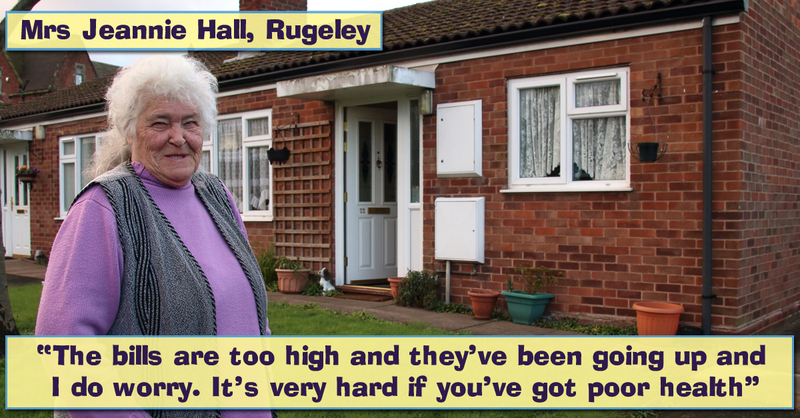 “I saw a leaflet about the scheme and went along to a local meeting. I liked the idea of putting money in and helping get the scheme off the ground. It’s a win-win situation for me – not only getting the electricity but also earning interest [on the investment]. There’s next to nothing in the cash ISAs at the moment. Aged 81, Mrs Hall used to work in local factories and her husband was a miner. 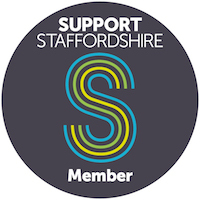 Mrs Hall’s son is a Town Councillor in Rugeley and is very supportive of the project. 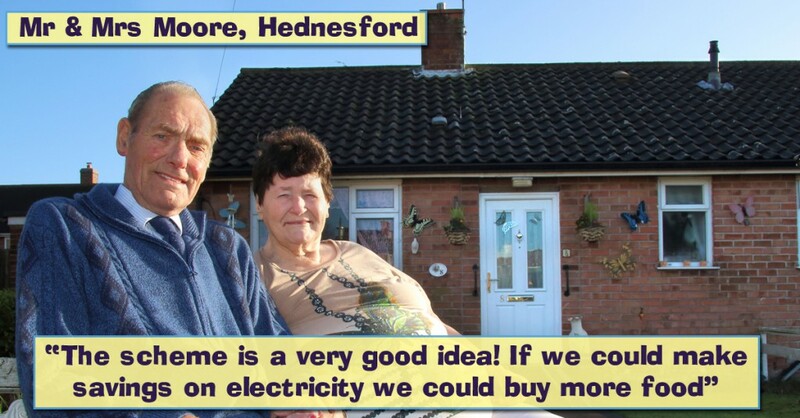 Mr and Mrs Moore, aged 76 and 73 respectively, live in the Hednesford area of Cannock Chase. Mr Moore is a retired artic lorry driver and the couple have three daughters, 11 grandchildren and 22 great grand children. Mrs Moore is disabled and diabetic. She has limited mobility and so keeping warm is a problem. The couple have to manage their fuel consumption very carefully as their budget is very tight. Bill Williams is a former professional boxer. He took up boxing at the age of 14 and was runner-up national flyweight champion in the late 1950s. When he gave up professional boxing he started working in the local coal mines and in 1958 was the National Coal Board flyweight champion. 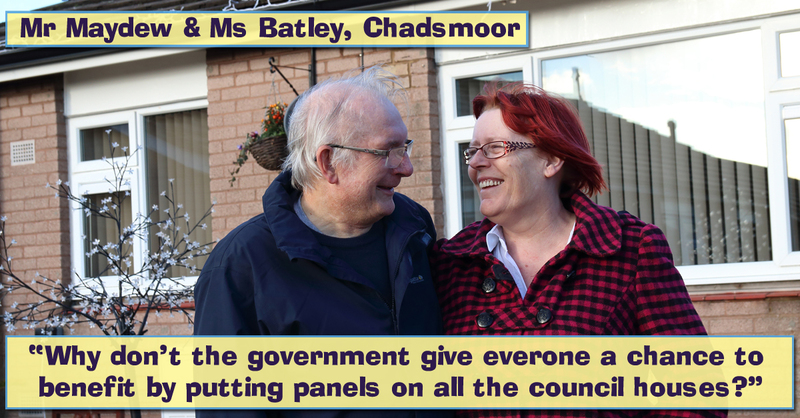 Mr Curley thought the council homes were generally well looked after and that if the technology is available to the council then panels should be installed. He currently spends £113 on gas and electricity per month. 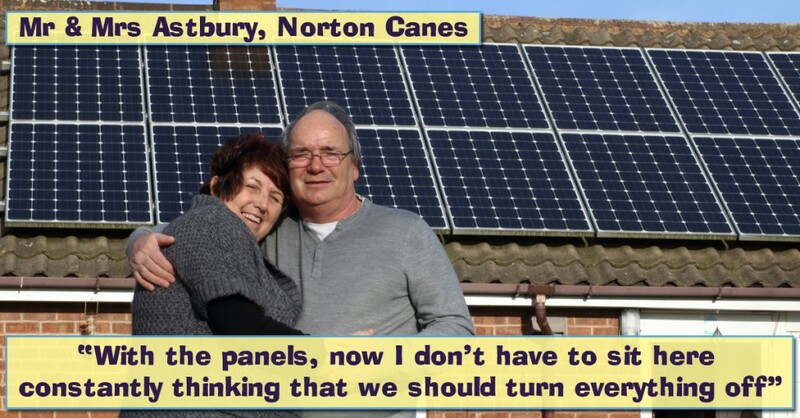 Pat and Richard Astbury live in High Street, Norton Canes, and had PV solar panels installed as part of a pilot scheme run by Cannock Chase Council in April 2012. Both of them suffer from serious ill health and are unable to work. Mrs Astbury says “You do worry about the bills when you’re both not working. But with the panels now I don’t have to sit here constantly thinking that we should turn everything off. 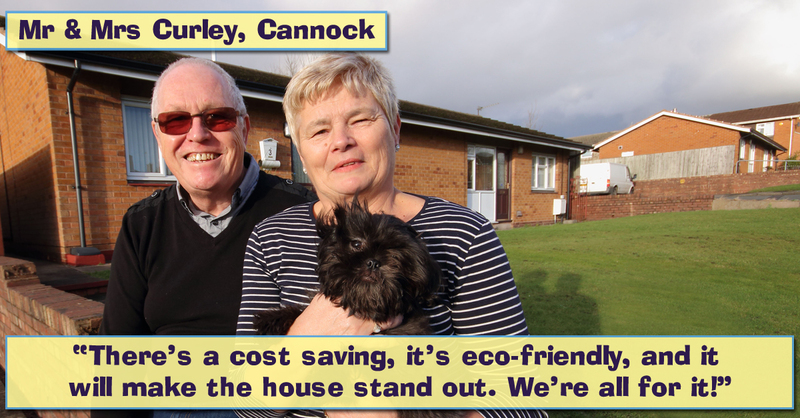 We’ve saved over a third of our electricity bill – at least £150 – it’s amazing and we’ve got a bit more money to spend on the grandchildren now. I thoroughly recommend it to others”.